CF | Cartridge filter | Oil filters | TAISEI KOGYO Co., Ltd.
Easy change cartridge type. Used as a line filter and a return filter. 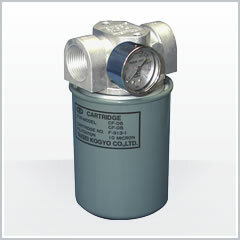 Choose one of 4 pressure gauge attachments on a body of filter.